Hi! 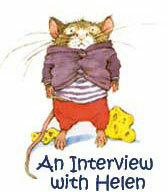 My name is Helen Lester and I have written many fun children's books, check them out! I taught elementary school for many years and now all my second graders have come back to haunt me! Tacky the Penguin (Tacky the Penguin book cover), Buddy Rabbit (Listen Buddy), Pinkerton Pig (Me First), Wodney Wat (Howay), Princess Penelope (& her parrot) and Twitchly Fidget (Something Might Happen) --they were all in my classes. Do you ever illustrate your books? I did illustrate Author: A True Story( Houghton, Mifflin, 1997) and the book explains why I usually work with an illustrator! The wonderful artist and person Lynn Munsinger, with whom I've done many books, draws what I would if I could. May I pick more than one? Author, A True Story because it encourages children to write. Yes, writing is like doing a maze. I have lots of wonderful ideas. And lots of un-wonderful ideas. So the trick is to keep trying to find your way. And the more you exercise your writing the better you get at solving that maze. Are there ever any mistakes printed in your books? Listen Buddy , p.26, and Author , p. 8 (hint: this one is in my own handwriting!) Can you find any more? Yes, and I especially treasure the ones that are Children's Choice Awards. Howay for Wodney Wat has been the choice of children in 17 states. Boris and the Worrisome Wakies. It's about a badger who will not go to sleep. That means trouble in school. Oh yes, I have about four stories rattling about. My favorite is one I have done with my husband Robin, called Frog Prints on a Platter. It's so funny it has us falling off our chairs. And if you're 81 you shouldn't be falling off chairs! After living in Chicago, New York City, San Francisco, and Minneapolis, I've settled in the town of Pawling, NY, in a beautiful area of woods and hills and animals. Yes. My husband Robin , who is an educator, historian and novelist (Look for Princes of New York - it's a super read! You can find out more by checking robinlester.net). We have two sons - Rob and Jamie - two daughters-in-law, Jodi and Danyle, and four grandchildren: Kate, Andrew, River and Elsie. I love to knit, read, cook, snowshoe and I currently hike 5 miles a day. My husband and I have also taken up badminton this year. In the winter we play it in snowshoes which is quite funny. I can beat him if he plays left handed and gives me a 10 point starting advantage. Where can I find more information about you and your books? We have a list of my children's books here. You can also try the Houghton Mifflin Harcourt web site [www.hmhco.com], any of the book stores on-line, and you might even try my name in your search box on the internet (I especially like to see some of the ways teachers are using my books in the classroom). For information on the possibility of my visiting your school, send an Email to: Anna Ravenelle at Anna.Ravenelle@hmhco.com. It was a pleasure. Would you like to see my photo album? Even if you wouldn't like to, here it is!